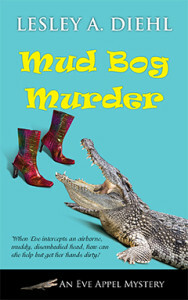 Mud Bog Murder ($15.95, 268 pages, ISBN: 978-1-60381-315-0) is the fourth cozy mystery by Lesley A. Diehl in a series set in rural Florida and featuring consignment shop owner and amateur sleuth Eve Appel. After a peaceful protest turns ugly and a friend is arrested for the murder of a customer, Eve Appel and her friends face the censure of their neighbors as they work to unmask the real killer. The series began with A Secondhand Murder and continued with Dead in the Water and A Sporting Murder. Three short stories, available as Kindle Singles only, also feature Eve Appel. They are The Little Redheaded Girl is my Friend, Thieves and Gators Run at the Mention of her Name, and Gator Aid. Lesley has five other published mysteries: A Deadly Draught, Poisoned Pairings, Dumpster Dying, Angel Sleuth, and Grilled, Chilled, and Killed. “The drama between Eve and her would-be boyfriends, her friends, and the mystery keep the reader guessing, the plot has plenty to recommend it. The conflict is tastefully well written and the characters all have enough depth to not only move the story but make the reader want to know what will happen next.” Read more…. 5 Stars: “Mud Bog Murder is rich with heart, strength of character, and independence. A must-read for any lover of mystery!” Read more…. “The charming, fun mystery kept me sifting through the clues and snorting at some outrageous scenes …. This is the fourth book in the series, but you can read this one without having read the other three. I did. The author drops in some tidbits about previous events and some character insight without barely a hiccup in the story’s flow. I hope you give this book a go. I pinkie swear you’ll have fun.” Read more…. “This is a great cozy mystery. There is lots of action and twists and turns. Eva does a great job fleshing out who the killer was and I admit that I didn’t guess who did it until the end. This is the first book of Lesley Diehl’s I have read. I had no problem figuring out what was happening and didn’t feel lost in the series. But I will be going back and reading the other books in the Eve Appel series.” Read more…. Even without the disembodied head, Eve has her hands full. The town resents her role in the protests and is boycotting the consignment shop on wheels. She is torn between two men—GQ-handsome, devoted PI Alex and tall, dark, and exotic Sammy. Jenny’s sweet and needy teenage daughter is dating a petty criminal. Will Eve and Madeleine ever be able to move into their new digs? Not unless the town forgives them. And not if whoever decapitated Jenny gets to Eve before she and her sleuthing buddies solve the mystery. “That’s exactly what you’re doing,” I screamed. He gave me the finger. The verbal exchanges continued until the trucks began to line up for their runs. At that point the sound of revving engines drowned out our voices. Mud flew in every direction. Madeleine and I pushed forward toward the fence to get a better view. Several trucks roared into the water, moved aggressively across the bog, and then abruptly stopped, mired in the middle. Neither increasing the RPMs or uttering foul language could coax the trucks from their mucky location. The drivers gave up, their growling trucks finally silenced, machinery defeated by mere water and dirt. A chain was attached to the trucks and a vehicle on land hauled them out. The drivers seemed only momentarily saddened by their failure; then their friends tossed them each a can of beer, and the partying began. “I think we should step back a bit or we’ll be covered in mud,” I said to Madeleine. She looked excited to be where she could see what was happening, and her color had improved. “You feeling better, honey?” I asked just as another truck roared into the water and attempted to cross the bog. As with the other two, it slowed and finally began to spin its wheels midway through the swamp. The driver continued to rev the engine. Muddy water thrown from the wheels catapulted vegetation as well as mud in our direction. The vehicle churned and rocked and continued to throw globs of whatever was buried in the muddy water out of the bog. I dropped my sign and attempted to fend off the gunk by shielding my face with my hands, but to no avail. The mud coated my head, face, and upper torso. I dropped my hands to my sides in disgust and frustration until the truck tried one more time, its spinning wheels sending more mud and a large projectile my way. I had no choice. I caught it like a running back grabbing a football. What the hell? It was no football, not even a chawed up turtle shell or mangled cattle egret. It was a head, and one I recognized. Two eyes glazed over by slime and death—one brown, one hazel—stared up at me. Madeleine looked over at what was in my hands and threw up all over my ostrich boots.